Ruben Gracia, of Yorba Linda, had no doubt about what to call his 1956 Chevy 210 coup when he began to restore it 3 ½ years ago. Gracia is a Sergeant with the Los Angeles County Sheriff and remembers what happened back in the day when the police came through the neighborhood. 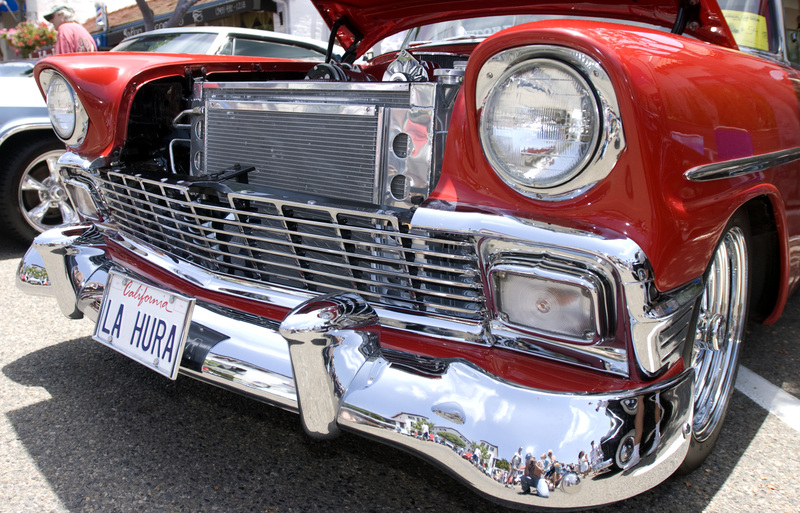 “La Hura” is Gracia’s first effort to restore a car and although he never thought about giving up, there were plenty of times when he wondered what would come next. He explains a tale of what many restorers can share about the past history of their car. Gracia estimates that he has put about 1500 miles on the car in the last 2 years since it has been done. Its his second year for the car show in San Clemente. Gracia doesn’t belong to any car clubs but has shown it at various sheriff car shows and says that inner city youth have shown a special interest in the car. “La Hura” has a 396 big block, gets 6 or 7 miles per gallon, and is a certified 13 second car; it will hit 60 mph in 13 seconds on a ¼ mile. Gracia hasn’t pushed the car but estimates it’s top speed at 120 mph. Gracia admits the red and white two tone is not original but says the colors really clicked. I pressed him on the ethic of keeping the car original. He sighed, acknowledging my words but dismissing the idea and responded confidently. I do not see how anyone on the road will miss “La Hura”. 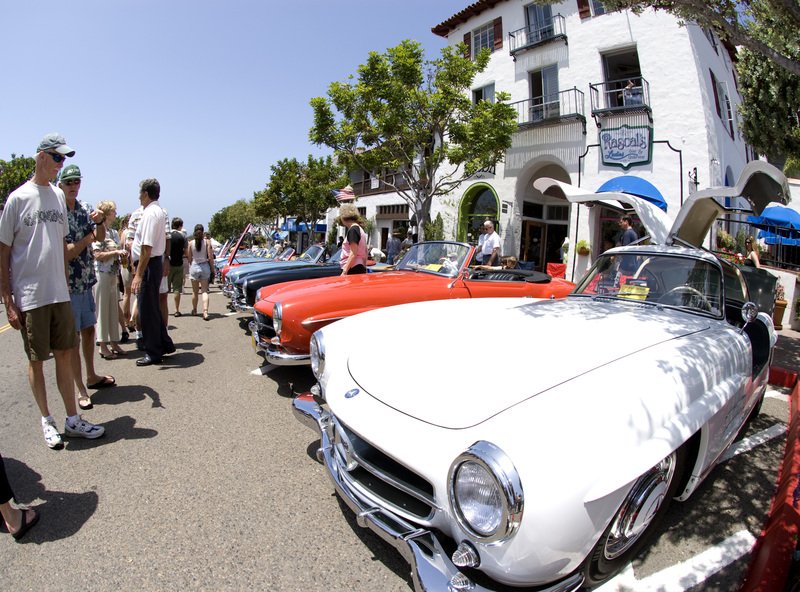 13th Annual Classic Car Show in San Clemente. 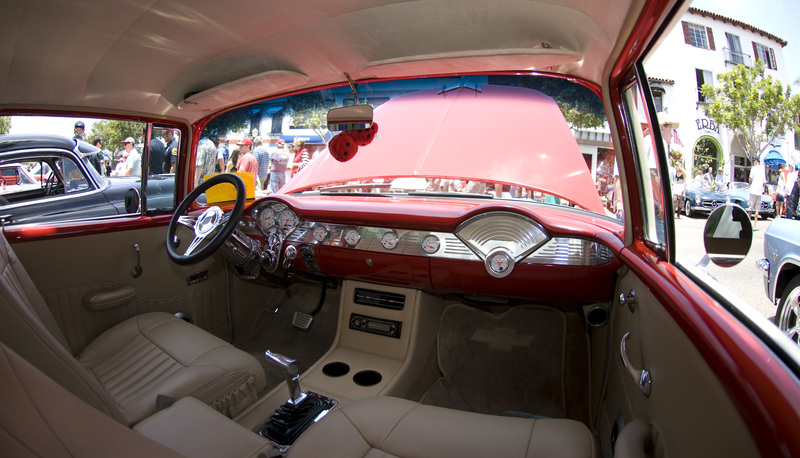 San Clemente celebrated the 2008 13th Annual Classic Carshow on Sunday from 10am until 3pm. Avenida Del Mar was closed off and about 5000 people meandered through, eating hotdogs, walking with dogs and kids, and just having fun amonst 300 classic car entries. It’s no doubt why the carshow gets bigger and better each year; its pure fun and this time of year the day is made for it. When I drove downtown to walk it I noticed that cars were parking down as far as the Ralpha-beta, which in terms for San Clemente, is a high water mark. They have been doing handicap curb and corner improvements on El Camino Real for the last week and it was a little confusing where to park but a sharp eye for a spot and a little leg work and we were there. This is a calm group compared to what we’ll see when they block off Del Mar in July for the Fiesta Block Party. It would seem the crowd was heavy on the male side of things, talking lift kits, paint and polish quality or DMV requirements, but there was really plenty of everyone. I just really covered the top part of Del Mar and further down I could see more booths and they had a band or two by the sound of it. I wasn’t working for the paper on this one and so took a little more time to look around and just sit and watch people go by. A Mercedes car club (see photo) had the premier spot in front of the San Clemente Hotel with about 10 cars or so and they had some nice stuff. A Wert daughter was there with a pink corvair I think and she was giving away lolli-pops and Mardi-Gras beads and letting people take photos sitting on the top of the back seat like they do for parades. There were a couple of off road entries in front of the old Whirl-i-Gig (now Hobie’s) that were slyly popping beers and pouring them into cups. They would pop the trunk on one of the cars where they had a cooler, pour the beer with the trunk hunkered down over their hands and appear again with a “soda”. What I always like the best are those long lost friends that meet up by accident and then stand and talk for an hour while significant other and children orbit back now and again to see what the status is. New found friends comment and counter-comment on other friends while significant other stares through the crowd, un-hearing one amazing feat after another. Children shift from one foot to the other, poke each other and stare at the new friend, calculating the right time to hit the parent up for cash in the distraction of it all. Hands are shook vigourously, hugs are traded with phones and e-mails written on business cards, napkins or slurpee cups, before each are on their way and a hardy “What are we doin’ now?” is declared to a near comatose family. Groans abound as they move into the crowd and disappear. I am thinking now that the carshow isn’t popular just for the cars.